Friday Follower Freebie is back! 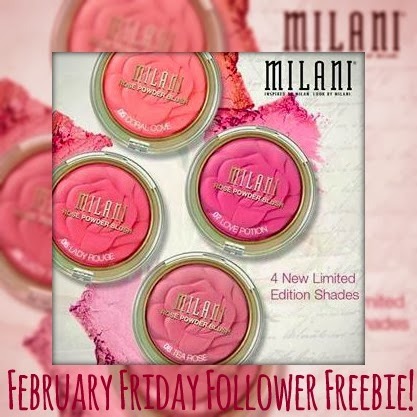 Milani Cosmetics recently announced they are releasing 4 new shades of the Limited Edition Rose Powder Blushes, and one follower will receive all 4 shades. Just fill out the easy Rafflecopter form below for your chance to win. Entries accepted through Sunday, February 17, 2014. Happy Friday, and Happy Valentine's Day to everyone! Followers only, please. Methods of following: Google Friend Connect, E-Mail subscription, BlogLovin', Facebook, Twitter, Instagram, and Google+. Not a follower yet? You can join by clicking your preferred follo method in the upper right corner of the blog!